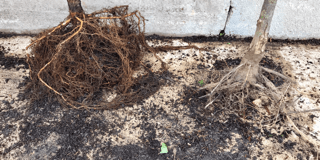 A problem that can occur with planting a container-planted or balled-and-burlapped trees is root circling. 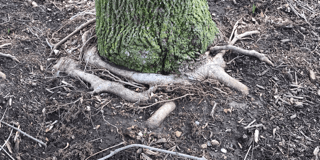 If the roots are not cared for properly when planting, they may continue to spiral around the base of the tree, in effect, strangling the tree before it has grown to full capacity. Often times, the damage will remain undetected until many years after a tree has been planted. Damaged root systems can cause leaves to yellow or drop. Healthy root systems take in water and nutrients more efficiently. So what can you do to get your trees off to a good start? 1. Select the right tree for the right place. Know the sunlight and soil conditions, as well as the needs of the tree. 2. Plant it right. Dig a hole 2-3 times as wide as the pot and just as deep as the pot. Expose the root flare by removing the soil from above and around the flare. Tease the roots! Teasing the roots before planting helps to untangle and encourage outward growth. For trees and shrubs, you will probably have to use a saw or sharp knife to cut roots vertically if they have already started circling. Mix in Espoma Bio-tone to soil and place the tree in the hole so the upper roots are just below ground level. Fill the hole with the removed soil (clay on bottom), water the roots and mulch, keeping it off the tree base. Click here for more thorough planting instructions. One of our tree suppliers has recently experimented with Accelerator pots to combat root circling. These pots have air pruning slots, allowing for the development of dense, lateral feeder roots. While still in the early stages, the results look good. Watch the Tree & Shrub Department, we're trying these new pots on some of our stock this year. A tree is an investment in the future and we want you to be successful. It is worthwhile to speak with The Growing Place Tree & Shrub Staff when selecting and planting. We offer delivery and planting services as well. The TGP Plant Search is a handy online tool when comparing options in selecting the right plant for the right place. This year marks our 83rd year in bringing you the healthiest plants, best selection and inspiration. Like a healthy tree rooted for long life, we are here for you!